Thank you for taking an interest in coaching. Coaching can be one of the most rewarding and enriching experiences someone can have. In your decision to becoming a coach you have decided to commit to use your skills and knowledge to ensure the success of amateur boxing as a sport and to have lasting, positive, impact on an athlete’s life. As a coach you are a teacher, a leader, a mentor. Many athletes will look to you for guidance and expertise. You will be the role model that will enable an athlete to develop athletic and social skills needed to succeed in sport and in life. A good coach can teach the skills. A great coach also inspires the love of the sport and instills respect for oneself and others regardless of the outcome of the bout. A legendary coach not only teaches and inspires others in and outside the ring but also constantly learns and shares their knowledge and thus, changes for the better the sport of boxing, the athletes and all those involved. Boxing Ontario delivers the National Coaching Certification Program (NCCP) for coaches in the province of Ontario. This program was developed by Boxing Canada in conjunction with the Coaching Association of Canada to improve the standard of coaching through education. Courses providing NCCP instruction in Introduction to Competition, & three are held regularly throughout the year in various locations around the province. The NCCP is a five (5) level education program for coaches in over 60 sports. It is available all across Canada, in both French and English, for coaches over the age of 16 years. Level three of the NCCP are comprised of three different components: Theory, Technical and Practical. Level one and two theory has been changed. All new coaches should take the Coaches Association of Ontario Introduction to Competition courses listed on page. Introduction to Competition (ITC) is a competency based course. Coaches who know their coaching certification number can check their certification status by clicking here. Coaching Tip – Coaches should also take Making Ethical Decisions Online Evaluation at any time during their coach path. It is an online course that is FREE(upon successful completion of Make Ethical Decisions course). It is a requirement to have. For more info contact the Coaches Association of Ontario. To find out more information regarding the Competition Introduction component of certification, check out the Coaches Association of Ontario web site at www.coachesontario.ca. The Coaching Association of Canada has completed re-designing a new diploma in NCCP Advanced Coach Education. This Advanced Coaching Diploma is now based on four themes of Coaching Leadership, Coaching Effectiveness, Performance Planning and Training and Competition Readiness. Diploma coaches will work through a problem solving process that requires analysis, planning, and implementation of new skills and knowledge in day to day coaching. Each coach will build a portfolio that will provide evidence of their coaching competencies.The new ACD curriculum will require phasing out old level 4/5 tasks in a manner consistent to the development of other NCCP multi-sport modules. Coaches who are completing their NCCP Level 4 accreditation, should contact the CSI Ontario (coaching@csiontario.ca) to inquire about completion of outstanding Tasks. A coaching resume including: Level of education (high school, college, university etc. ), level of athletes coached, coaching recognition (awards, major highlights, achievements, scholarships) and coaching positions held. A letter stating why you want to attend the NCI including statements regarding your coaching career goals. A description explaining the current context in which you are coaching (level of athletes, number of hours spent with them, program goals etc. Teaches important principles of coaching such as planning, sport safety, ethical coaching, nutritional planning, skill analysis and growth and development. Theory courses are taught by NCCP Certified Coaching experts. Presents the skills and drills of each sport as well as sport-specific information on rules of play, equipment, and skill development. Technical clinics are delivered by Boxing Ontario instructors. For a list of upcoming technical clinics go to “Coaching Clinics” from the “Coaches” main menu. Provides coaches with feedback on their ability to apply coaching knowledge through self, peer or examiner evaluations. To get your Introduction to Competition A or B, you must attend a total of 14 hours at a Community College, taking the Theory course session. This session usually lasts 2 days. Intro to Comp courses are scheduled by the NCCP, not Boxing Ontario. To find a session in your area visit http://www.coachesontario.ca/. Click on “Find Courses”, then enter NCCP Mulit-Sport in the Course Category, Introduction to Competition A in the Course Sub-Category, then choose from a list of Ontario locations. If you are having difficulties finding a session in your area contact the Coaches Association of Ontario directly 416.426.7056 or jeremy[@]coachesontario.ca. Sign up for the course by contacting the instructor or CAO. These modules are 2 full days (16 hours) You can take an Apprentice Coach Module or Club Coach Module prior to or after an Intro to Comp course, but you must take both and you MUST complete the Apprentice Coach modules before you can take any Club Coach Modules. 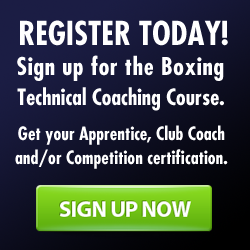 In order to register with Boxing Ontario you must complete the Apprentice Coach module. Modules are usually offered once or twice per month and the dates and locations are determined by the Instructors. Visit Coaching – Coaching Clinics on our website for a listing of Modules offered. If there are currently no Modules offered please contact Boxing Ontario to add your name to our waiting list. Please note – all NEW coaches must also submit a police records check including a vulnerable sector check with their application form when registering with Boxing Ontario- for details on how to obtain a records check please contact Boxing Ontario. PRC’s are valid for three years.